The Monday April 11, 2011 ruling from Judge Alex Kozinski, chief judge of the U.S. Court of Appeals for the Ninth Circuit in San Francisco, appears to put an end to the ongoing legal battle between Cameron and Tyler Winklevoss and a third Harvard classmate, Divya Narendra, and Mark Zuckerberg. The trio of the the “Winklevii” (nickname given to the twins by Zuckerberg, according to The Social Network movie) and Narendra filed suit in 2004 against Facebook and CEO Mark Zuckerberg. The trio alleged that Zuckerberg had stolen the idea for Facebook from them. Here’s a video showing the real-life Winklevii discussing the movie and showing a very different opinion than Facebook employees have expressed about the events. 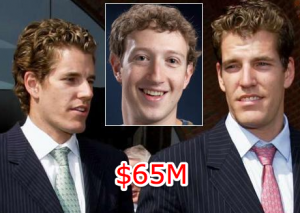 The back-and-forth court drama played out publicly until 2008, when the Winklevosses and Narendra signed a settlement valued at $65 million, part in cash and part in Facebook stock. However, the later on tried to pull out of the deal, alleging that Facebook had misrepresented the value of its stock. A judge ruled against them and forced the settlement to go through, but the Winklevosses and Narendra took the case to court. The Winklevosses are not the first parties bested by a competitor who then seek to gain through litigation what they were unable to achieve in the marketplace. And the courts might have obliged, had the Winklevosses not settled their dispute and signed a release of all claims against Facebook. With the help of a team of lawyers and a financial advisor, they made a deal that appears quite favorable in light of recent market activity…. For whatever reason, they now want to back out. Like the district court, we see no basis for allowing them to do so. You can read his full report here (PDF file). Is this the end of the Winklevoss-Zuckerberg court drama?